Was it a Plan or a Premonition? I’ve often come across stories of people who have had a premonition of some future event. Sometimes these can be quite vague such as an intense, irrational feeling that something significant is about to happen. Occasionally however a premonition is very specific and proves to be so accurate that it is hard to dismiss as mere coincidence. So could it be some kind of paranormal occurrence and if so, how can it be explained? For example, how could I, as a 3 year old child, have accurately predicted the specific house where I would be living some thirty years later? Elsewhere on this website, I’ve written about a life-changing therapy appointment that I had with Carol Lamb and how she astounded me by declaring, “Michael, you need to be writing music”. These seven words intrigued me in so many ways but I was most puzzled by why I needed to be writing music; it was as if this wasn’t really optional for me. I raised this in my follow up appointment with Carol, expecting her to say that all she meant by this was that it would be good for my well-being to spend some time in musical pursuits. That wasn’t however the answer she gave me! Carol started by giving me some background, explaining how souls reincarnate many times on earth in order to gain experience and to be given an opportunity to learn and grow in conscious awareness. Those that have chosen to learn and evolve are given help by spirit guides who work with them in the periods between earthly lives to map out an optimal life plan for their next incarnation. Unfortunately, the memory of a life plan invariably fades away shortly after birth and so these guides provide unseen assistance and prompts to help bring individuals into contact with people and places that are important life plan connections. It is however for each person to decide whether to engage with these connections: they have total freedom to choose whether or not to follow through with their life plan. Carol then returned to my question. She explained that part of her gift is an enhanced intuition that gives her an insight into the life plan of some of those who come to her for therapy. In my case, she had a very strong feeling that composing music was a key part of my plan and that I needed to engage with this in order to move through the difficulties I was facing in my life at that time. Carol’s explanation of a life plan threw an entirely new perspective on something unusual that had happened to me a few years earlier. When I was in my thirties, my wife and I were looking to move house and one of the properties that we arranged to view was a detached house in an area close to where I was brought up as a child. 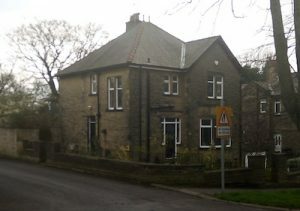 It had been built in the 1920s and had a number of attractive features typical of homes built at that time. Both of us preferred properties with character to newly-built homes and so this was just the sort of house that we had in mind. 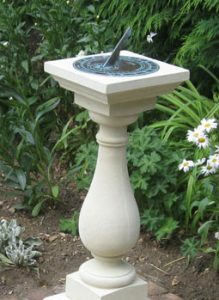 For some strange reason, the two features which stood out for me were a garden sundial which was mounted on a carved stone plinth and a steel security safe that was built into a wall in the basement. I couldn’t understand why these had a particular pull for me. After all, we didn’t have any belongings or documents that needed to be kept under lock and key and the sundial served no practical purpose. Although we both like d it, my wife wasn’t as keen as I was to put in an offer but after viewing a few more houses (and after enduring relentless wittering by me about sundials and safes) she eventually agreed we should go ahead and buy it. Apparently, when I was only about 3 years old, I had been spending time out with my father. Our route took us past the house which was now my new home and as we approached it, I’d stopped my dad and told him that this was my house and I was going to live there. According to Tony, my dad had been really amused by this bold assertion, especially since our home at the time was a humble back-to-back terraced house with an outside toilet. I had no memory whatsoever about this incident but Tony was adamant that my father had told him this story and that it was the same house where I was now living. My discussion with Carol about life plans and guides had given me a totally new perspective on this incident. Perhaps three year old me had been given a premonition, a glimpse into the future as Tony had suggested but it also seemed possible that I had ‘remembered’ that this house was on my life plan. Could the house, the land that it was on, or the people that we bought the house from have been important life plan connections? Were unseen guides influencing me when viewing the house in order that I might follow through on those connections? Is that why I felt inexplicably pulled by the sight of the safe and the sundial? Of course it might just have been a very improbable coincidence but I find that hard to believe. After all, ‘Coincidence is just God’s way of remaining anonymous’.